1 of 4 Sprinkle roast with 1/4 teaspoon each thyme, salt and black pepper. Heat oil in a large nonstick skillet over medium-high heat. Cook roast 1 to 2 minutes per side or until browned; transfer roast to slow cooker. 2 of 4 Reduce heat to medium and add onion to skillet; cook 3 minutes or until softened. Stir in tomato paste and cook 1 minute, stirring constantly. Stir in flour and cook, stirring constantly, for 1 minute. Whisk in wine, broth and 1 1/2 cups water; bring to a boil. Pour liquid into slow cooker over beef and cook on HIGH for 6 hours or LOW for 8 hours. 3 of 4 When there is 3 hours cook time remaining on HIGH or 4 hours on LOW, remove meat from slow cooker and stir in carrots, celery, potatoes and remaining 3/4 teaspoon thyme. Return meat to slow cooker for remaining cook time. 4 of 4 Remove meat from slow cooker; slice. Stir remaining 1/4 teaspoon salt into liquid. 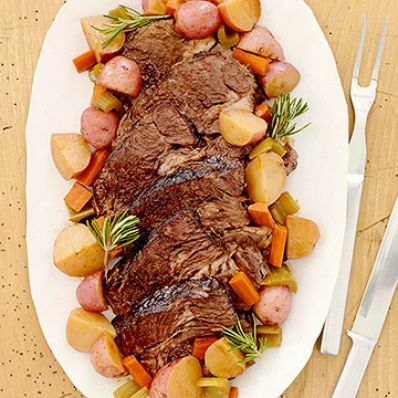 Serve roast with vegetables and sauce. Makes 8 servings.